Vacation homes should always be ready upon arrival. And innovative automation has paved the way for your luxury getaway to respond upon command, from any distance. With remote system control, smart cameras, lighting, learning thermostats, and hi-fi audio, go to work before you walk in the building. And of course, the maintenance plan. Ensuring all technology is up to date and running smoothly 24/7. With Responsive Living, a stylish modern sanctuary always awaits. Take a look at a vacation home that comes to life with a single tap from anywhere in the world. My career keeps me based in New York City most of the year, with frequent trips to other international hubs. But when I want to escape the noise for a while, especially in the dark gray winter months, I hop on a jet to Miami. 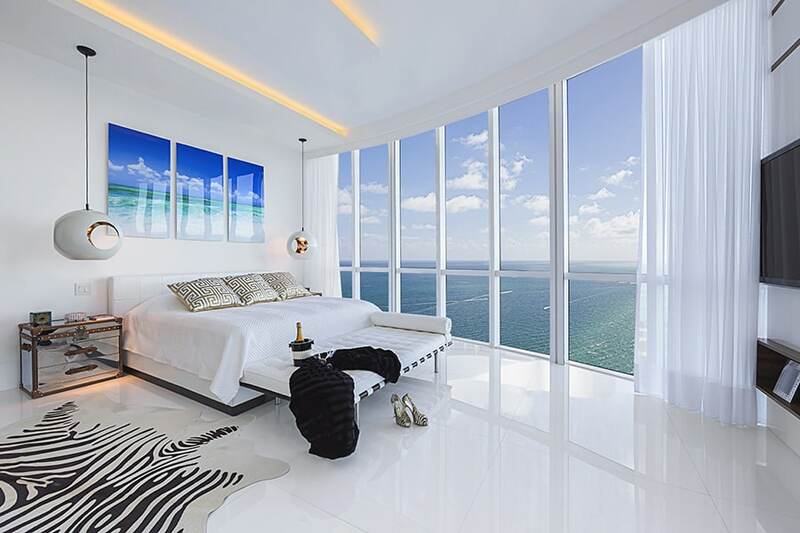 A very smart residence overlooking Biscayne Bay awaits. On the ride from the airport, I pull up my Savant System app and start to set the scene for my arrival. With one tap, the shades retract to expose the views over the Bay from my living room and kitchen. With another, the lights come on in the hallways, illuminating artwork I had shipped over from London last year. The climate control starts to cool things off. And then, the most important command, music. I’ve curated a perfect playlist for the occasion. I use my phone for keyless entry when I arrive at the building. I can disarm the alarm as I step off the elevator into my sunlit penthouse. Since last year, I’m always a little anxious upon approaching the living room decor. After a long journey from Africa and a stopover in Brazil, I came straight to Miami. I hadn’t yet installed the automated shades, which proved to be a huge mistake. The sun had come in through the floor to ceiling windows unchecked, for several months. And as a result, my gorgeous cobalt velvet sectional, sitting in the direct path of UV rays, was completely bleached. My home was already wired for the addition of automated window treatments. Now I make sure the shades stay closed while I’m away. Guests stay here on occasion while I am away. I can check the status of the shades through my Savant app, no matter where I am in the world. So if they are left open when the place is unoccupied, I can easily shut them with a quick tap of my phone. Fortunately, my new sofa looks perfect. And it is time to watch the sunset over Biscayne Bay before I head out on the town. I use voice commands to open the Bay Doors onto the balcony. I pour myself a drink as the ocean air starts to come in. My smart thermostat shuts the cooling off inside, conserving energy. With another command, the music fills the patio. Having a smart getaway has changed my idea of travel. Automated homes are popping up all over the globe in my favorite travel destinations. The comfort and ease of the Responsive Living concept is absolutely the wave of the future and the now. If you would like to learn more about automation for your vacation home, feel free to connect with us. We will be happy to schedule a demo with you.